There are a gazillion bazillion (and whatever means infinity) granny squares out there. I was looking them up because I am contemplating using different granny squares than the ones called for in the pattern for the black sweater I want to make. I’m not sure yet if I’m going to switch it up but I found these granny squares that totally captured my attention. I kept staring at it and mentally fondling it so I knew I had to share. You can find the pattern for this here. It’s on Ravelry so you need an account. If you don’t already have one, you really need to get one. There is so much content to explore. This granny square is so colorful and thought it worthy of being shared. And last but not least, I thought this was too beautiful to pass up. My 4th grade student is close to finishing her first rag doll. I am so proud of her! Working with kids is always a joy and being able to teach them how to crochet is a bonus. I look around me while I’m working and get so happy when they ask me if they can crochet on their free time. I wonder how many life-long crocheters I’m turning out into the world (hopefully a bunch!). So many of them want to make dolls like I do and the rag dolls I’ve been making are a big hit. Their sole purpose was to inspire the kids to move on from chains and into single crochet so they could make their own dolls. So I’m very excited that my student is close to finishing her doll. Our program is built on finishing homework and then having fun so there are a lot of choices and things to do vying for their attention, with crochet being just one of them. But amongst all that, she’s getting close. I couldn’t wait to share her almost done doll! I was cleaning out my wallet when I found a gift card to Joann’s. I received it for Christmas from a friend. I treat gift cards same as cash and sometimes agonize over how to spend them properly. I have a frugal heart already and when someone gives me a gift card, I want to honor that by spending it as wisely as possible. I went to Joann’s awhile back armed with a 60% off coupon for one regularly priced item and my gift card. Joann’s is very smart. You can’t you use that coupon on sale items and usually what I want is on sale. I did have a coupon for 15% off all purchases but not on door busters. But naturally, what I wanted was a door buster. I walked around looking at things with my 16-year-old son in tow. He wasn’t rushing me but I knew Joann’s wasn’t his favorite place. I didn’t really want anything specific and the sales and my coupons weren’t in sync to optimize what I did want so I didn’t get anything at all. I forgot about the gift card until I noticed it in my wallet yesterday. I was also thinking about that pretty sweater I posted about recently and how I wanted to get the yarn for it. Now was a good time to get it because of my gift card AND some good coupons. I was going to need 13 skeins of yarn. I had five 60% off coupons and a 20% off any purchase coupon. I was ready! I went into the store and looked for my yarn. It was not on sale so that meant I could use my coupons. The first problem was that I could only buy five skeins of yarn when I needed 13. I already knew this and was prepared to reprint my coupons two more times and make two more trips to the store before they expired on Sunday. It was inconvenient but doable. The second and bigger problem was that the store didn’t even have all the skeins I needed. One color was completely out and the main color I needed (8 skeins) only had three or four. The third color was fine. I didn’t want to buy what they had and run the risk that they wouldn’t get more when I needed it so I went on a search for similar yarns. I pulled out my phone and spent a long time looking at yarns and calculating prices based on the coupons I had, whether they were on sale or not and if they carried a similar yarn. I was going a little coo coo but I was having fun. No one was waiting on me and I had all the time in the world to calculate to my heart’s content. I eventually settled on a compromise between price, available colors and softness of the yarn. The yarn I chose wasn’t as soft as the yarn called for in the pattern but it wasn’t bad. The colors were good and very close to what was needed. The pattern calls for black and two grays. This line only had the black and one gray. I could work with that. I thought might even have a gray I could work with already in my stash but if not, I could make do. Soon to be a sweater! In honor of the Renaissance Faire that’s coming to town, I thought my Freebie Friday would be something I could wear to the fair (if only in my dreams). I found this top years ago when I was looking for a stitch that might resemble fish scales. I wanted to make a mermaid costume and this pattern was one of the firsts I found. I loved it so much I have kept it and fondled it all this time (yes, you can fondle a pattern). I never actually made it exactly as it was written but it definitely inspired me to make some of my favorite pieces with that crocodile stitch. I finished my mermaid skirt and made a top go with it. I was a little too shy to make the top as revealing as this one but it was still pretty. I’ve seen similar attire to the dragon top worn at previous Ren Faires and perhaps one day (after working out like crazy and losing a few pounds) I might be bold enough to make it and wear it. I love looking at it though. It is hands down something a dragon slayer would wear under her dragon cloak! So for those who would dare, you can find this gorgeous Targaryen Dragon Scale Bikini Top here. And for those of you dying to know what my mermaid skirt and top looked like, here it is being proudly worn to Ren Faire one year. I was supposed to fan the bottom portion out and fill it with stuffing so it would look like a fin but I never got around to it. I just let it hang but most people still recognized it as a mermaid outfit. This outfit was inspired by the dragon top. I should have found better shoes though! 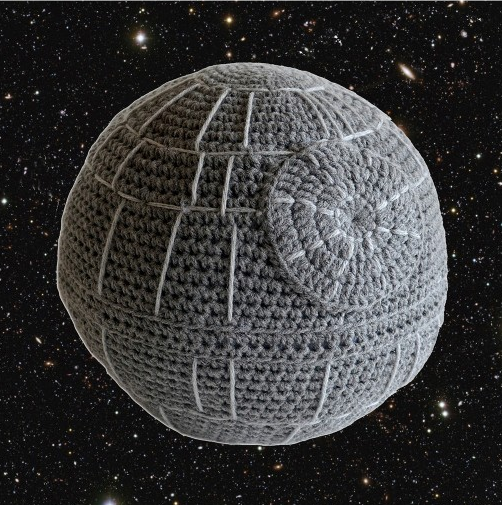 A close friend (and sis-in-law) sent me a link to a Star Wars Crochet Pillow. I followed the link and saw this!